ShukerNature: REVIEWING 'THE MEG' – JUST WHEN YOU THOUGHT IT WAS SAFE TO GO BACK IN THE CINEMA! REVIEWING 'THE MEG' – JUST WHEN YOU THOUGHT IT WAS SAFE TO GO BACK IN THE CINEMA! I'm gonna need a bigger cinema! 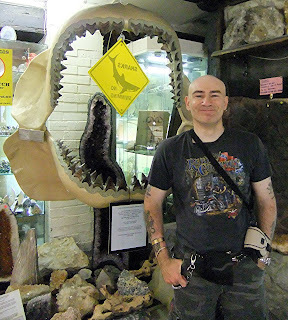 Yes indeed, I could well have been forgiven for thinking that, because the reason why I visited my own local picture house on 10 August was to see the newly-arrived cryptozoology-themed monster movie The Meg, which I've been awaiting with great anticipation for ages. 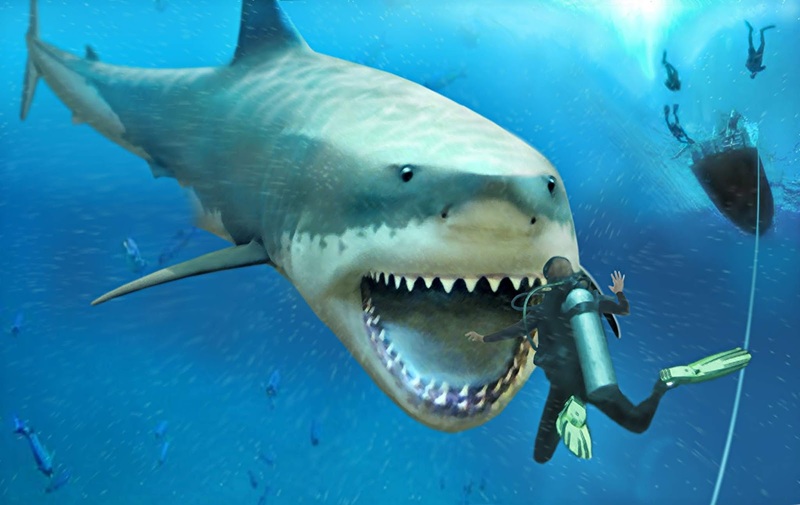 Directed by Jon Turtelbaub, co-produced by Warner Bros. Pictures, and based upon the bestselling novel Meg by Facebook friend Steve Alten, its nominal star is Jason Statham, but its real stars are a couple of CGI megalodons, representing the giant prehistoric shark Carcharocles megalodon – the largest shark species ever recorded by science. 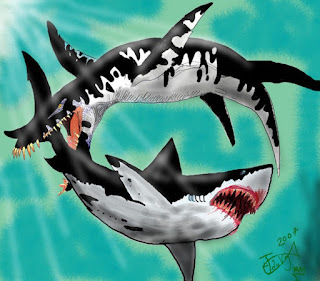 Officially, it became extinct approximately 2.6 million years ago during the late Pliocene epoch, and is principally known physically only from fossilised teeth and vertebrae, but thanks to some intriguing eyewitness accounts on file of supposedly gargantuan sharks, some mystery beast investigators have speculated that it might still exist today. 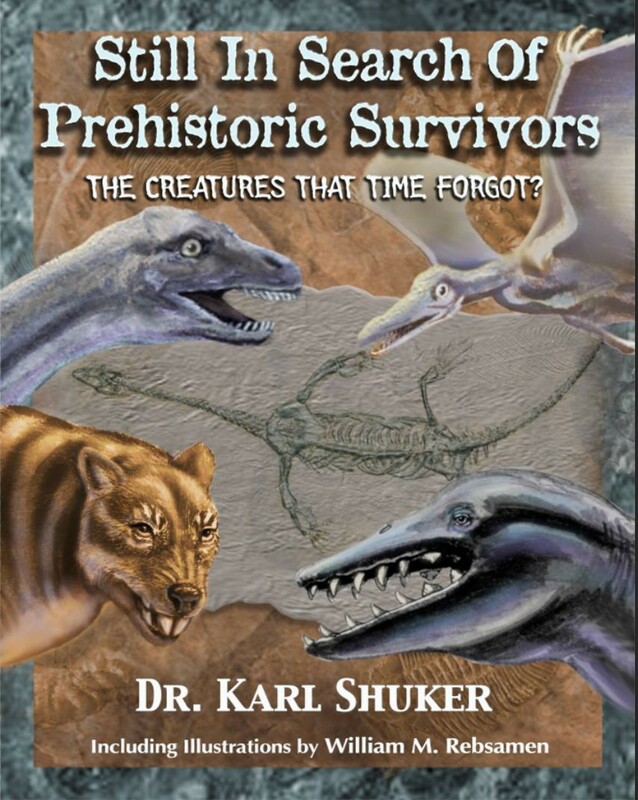 Be that as it may (or may not), this review of mine is of the film, not cryptozoology per se (click here to read my own thoughts concerning the exceedingly contentious prospect of megalodon survival as posted by me earlier on ShukerNature and excerpted from my book Still In Search Of Prehistoric Survivors). So, back to the movie. 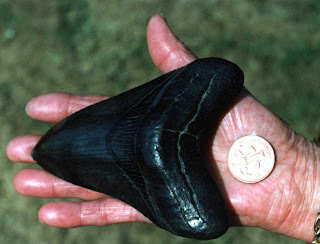 When the megalodon was first made known to science and formally named back in the 1840s, based upon its triangular and highly-serrated teeths' huge dimensions (up to 7.5 inches high - 'megalodon' translates as 'big tooth') an estimated total length for the entire shark of around 75-98 ft was postulated, but in more recent times, following further researches, this estimate has been downsized to 'a mere' 43-55 ft (although to put that into perspective, this is still more than twice the length of the great white shark Carcharodon carcharias, the largest species of carnivorous shark KNOWN to exist today). 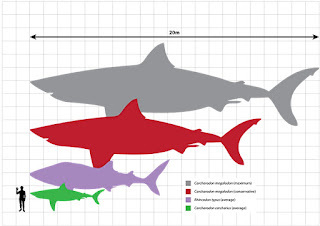 However, The Meg is a monster movie, not a shark documentary, so the film makers have adhered to the flawed earlier but cinematically much more spectacular 75-ft dimension (think Jaws writ large - very large!!) 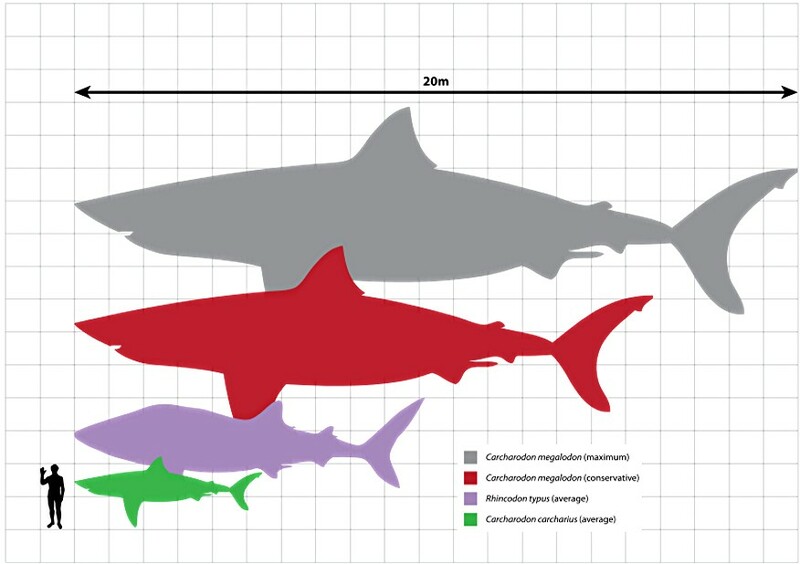 - resulting in a truly mega megalodon, a prodigious prehistoric behemoth which if it had lived in an earlier geological era would have been a veritable Jurassic Shark (come on, you knew full well that I was never NOT going to work in that pun somewhere!). As this is a newly-released movie that many fellow cryptozoology fans will definitely be going to see, I'll avoid spoilers, but the scenario of how the megs are discovered is quite fascinating, and they have been digitally recreated on screen to stunning effect. Once their discovery has been made, however, the plot adheres by and large to the typical, generic monster movie storyline - a flawed but immensely brave hero sets out to confront said monster(s), interacts along the way with a villain and a naysayer, some wisecracking sidekicks, a cute extra-smart kid, and an initially aloof but ultimately adoring, sassy lady, and after a series of thrilling set pieces finally battles said monsters(s) in a climactic confrontation of epic proportions. But hey, you already guessed that without even needing to watch the film - and who goes to a monster movie to be blown away by the intricacy and intellectual, deeply philosophical nuances (or even the scientific authenticity) of its plot anyway?? What you go to see is the monster(s), and this movie definitely delivers on that score. 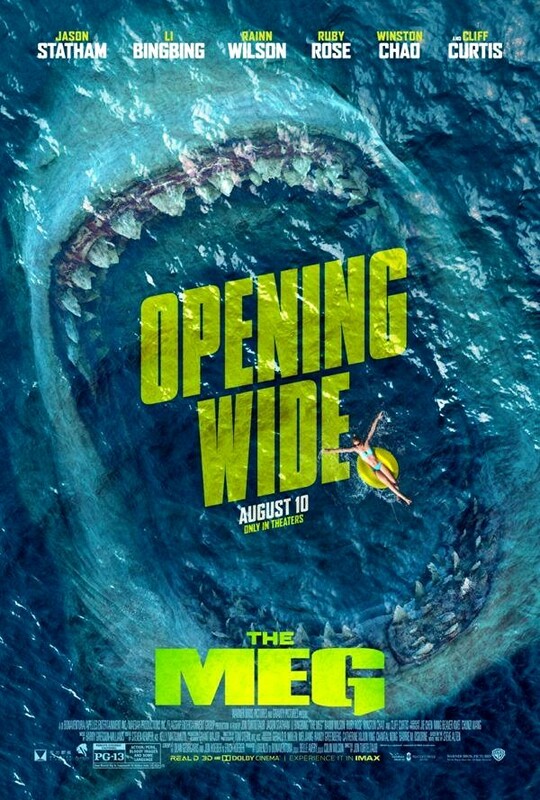 I viewed it in 2-D, but I may well go back during its run to see the 3-D version too - I'm not normally a fan of 3-D movies, but there is no doubt that The Meg will do the format justice as it is exactly the type of film benefitted by it. Despite living over a hundred miles (maybe more) in any direction from the sea, an erstwhile friend of mine was seriously galeophobic (afraid of sharks), and I wouldn't recommend this film to anyone with a similar fear, but hardened monster fans will lap it up - it certainly engaged my attention and interest throughout. I can always tell how entertained my mind is by a film by noting how far through it I've viewed before looking at my watch to see what time it is and then calculating how much more of the film remains - with The Meg, I never looked at my watch once. One word of advice: don't bother, as I unfortunately did, (im)patiently sitting through the interminable credits at the end of the film in the expectation that there will be a teaser clip to some projected sequel inserted within or at the end of them - there isn't one. 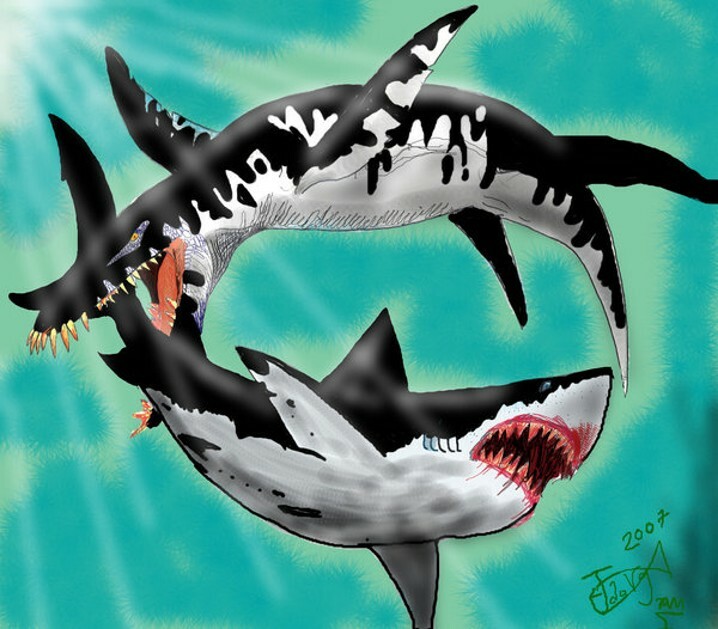 Oh, and just as a BTW: yes indeed, Pippin the Yorkshire terrier does survive his (very) close encounter with a megalodon (whoops, too late for a spoiler alert now). I fully expect that some movie (and also possibly some palaeontological) purists will opine otherwise, but I LOVED The Meg, a worthy new addition to the ever-popular cinematic genre of giant beasts on the rampage, and which along with Jurassic World: Fallen Kingdom and The Shape of Water (click here to read my ShukerNature review of the latter film) has definitely made my 2018 movie-going experience a truly monstrous one - but in the best possible way. Finally: to view on YouTube an extended trailer for The Meg, please click here. I wish to dedicate this ShukerNature article to my longstanding online friend and fellow cryptozoological enthusiast Robert Michaels, whose passing earlier this year I only learnt about on 10 August, just a few hours after returning home from watching The Meg at the cinema. How very much he would have enjoyed seeing this film, and how very sad I am that he will never do so. Godspeed, Bob, may you now know the answers to all of the countless cryptozoological questions concerning which we corresponded with such shared interest, enjoyment, and zeal over so many years. Please click here to read my tribute to Bob on ShukerNature. 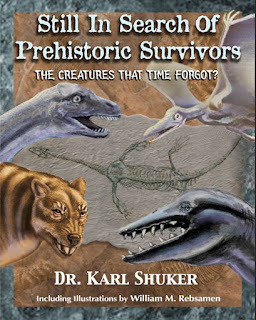 The book it was based off of was a good book. 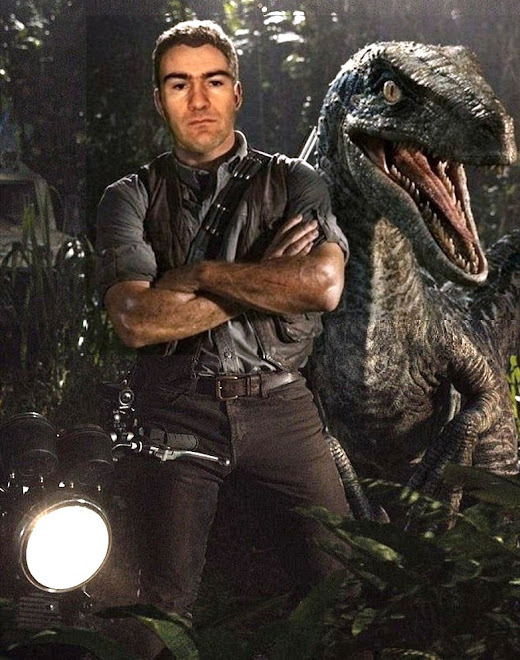 So was Extinct. In the horror film/literature community this film became a "when pigs fly" situation because how often the adaptation frequently changed rights holders with multiple directors and casts announced as attempt after attempt failed. So it's something of a miracle that the film even exists here at all, let alone has become as good as it is. I'm honestly surprised the film did so well. Jason Statham is not exactly a box office draw, and in the years the film has been in development hell, we have had what seems like 1,000 giant shark/Megalodon films. Shows you what I know!